George III loved his children dearly. But, like most parents, he didn’t like how quickly they grew up. He would probably have liked them to remain little forever, and he always treated them like they were. He made sure his heir stayed well away from all political affairs, refusing to teach him the job and give him the practical training a good king badly needs. His six daughters didn’t fare better. They lived a secluded, quite life they knew would end only with marriage. Problem was, their father didn’t seem keen to arrange any union for them. To start with, he limited their choice of potential husbands. Anyone who was a Catholic or of an inferior rank was excluded. Then he decided that younger daughters couldn’t marry until the elders were settled. But, really, he just didn’t want to let them go. And when he went mad, all talk of marriages was put off while doctors tried to cure him. And so princess Mary, his fourth daughter, waited and waited. No doubt, over the years, she had started to believe her time would never come. But it did, eventually. 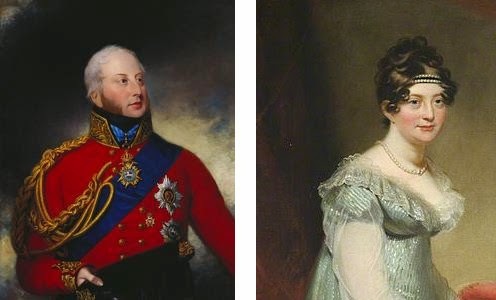 Mary was 40 when she finally married her cousin, Prince William Frederick, the Duke of Gloucester and Edinburgh. The 40 year old prince, regarded as a tiresome fool by most of the family, had been on hold to marry Princess Charlotte, the heir to the throne, should no other suitable candidate be found. But she had just married Prince Leopold of Saxe-Coburg, leaving William Gloucester to marry Mary. The speed at which the marriage took place suggests the couple was fond of each other and already had some sort of longlasting understanding. On 22 July 1816, Mary and William tied the knot in a private ceremony in the grand saloon at St. James’s Palace. It had been draped in crimson velvet and gold lace for the happy occasion. When all the guests were assembled in the saloon, her brothers, the Dukes of Cambridge and Clarence handed her in. The Princess looked modest and overcome. According to the Ladies Monthly Museum: “Her Royal Highness was dressed with her usual beautiful simplicity; she wore no feathers, but a bandeau of white roses fastened together by light sprigs of pearls. Her neck was ornamented with a brilliant fringe necklace: her arms with bracelets of brilliants formed into flowers, and her waist with a girdle to correspond with her bandeau. Her whole appearance was very lovely. The ladies present were also most splendidly dressed: the prevailing color was blue.” The groom was dressed in his uniform of a field-marshal and wore the Order of the Garter.